On the day of their court-ordered displacement, residents, organizers, and supporters of Camp Namegans tent city rallied for a protest in Rudd Park in Saanich, British Columbia – Lekwungen territories of the Esquimalt and Songhees Nations. As media set up their cameras, a U-Haul truck pulled up and we got to work putting all of the residents’ belongings that had not been seized by the police into the truck. Protestors gathered to hear speakers describe the eviction of Camp Namegans from Regina Park and chart the road ahead. Rose Henry (Sliammon/Snuneymuxw) organized the group into a circle and led a territorial acknowledgment. Camp founder Chrissy Brett (Nuxalk) gave a speech describing the displacement of Camp Namegans. Police arrived at Rudd Park before organizer Ashley Mollison explained the plan to the marchers and media – to take to the street and march to City Hall where there would be more speakers. The plan to march to City Hall was a deflection to deceive the cops. The real plan, known to residents and organizers, was to turn a block before City Hall and march to a Provincially-owned site to re-establish the camp. But as marchers took to the street, a police truck drove up and blocked-in our U-Haul. A melee broke out as police and a few marchers argued over the truck. 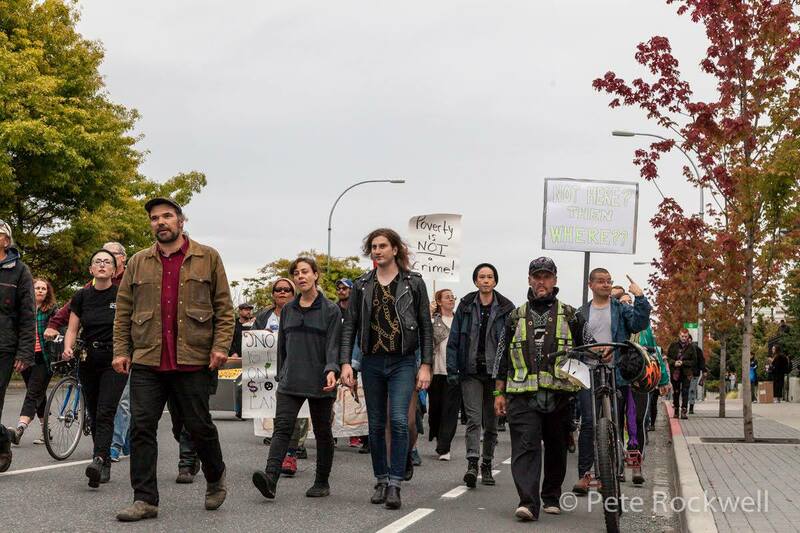 When police arrested a resident of Discontent City who had come from Nanaimo in an act of tent city solidarity, the marchers turned around to protest. Police called for backup and there was a tense standoff as police formed an offensive crowd control line. Thinking quickly, protest marshalls broke out of the police encirclement and regrouped on the other side of the police line. We marched forward with purpose towards the new camp site. At the height of the police presence there were over ten cop cars following us and another 20 officers on foot. As we approached a major intersection, we saw that continuing straight was not an option. The marshals ran through the crowd, organizing a quick turn left. The march turned at the lights onto a three-lane one-way street of opposing traffic, which was all stopped at the red light. A hundred protestors threaded through the vehicles. Supportive drivers cheered us on and bigots spat at us. The police cars were unable to follow us into the tight traffic. We had out-maneuvered them. We emerged out of the traffic jam and cheered as we reunited, no longer separated by the cars. We were minutes from the Provincially-owned site at Cary Road and Ravine Way. But between us and our destination was a police blockade of two cars and two officers. We called those willing to risk arrest to the front of the march. Our chanting grew louder and we marched shoulder to shoulder. Decisively, we stormed through the police blockade, chanting, “The people united will never be defeated.” The two officers stood helplessly by as we funneled past them and into the park that Chrissy Brett soon named Namegans Nation. The new site of Namegans Nation held for four days. 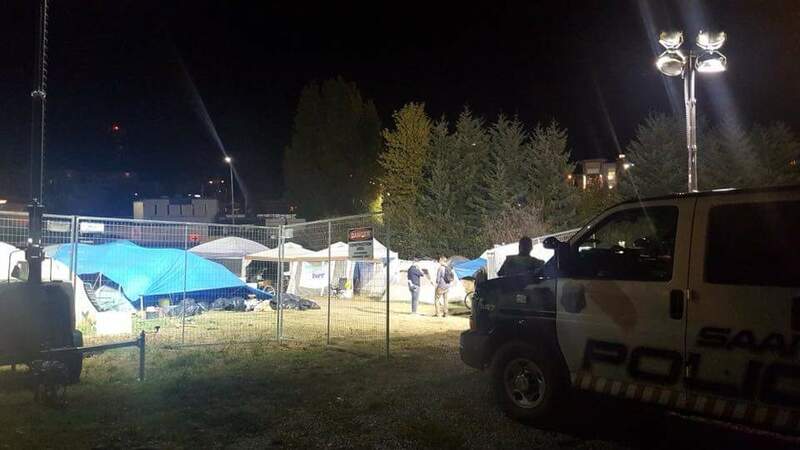 On Tuesday September 18 at 8am, police raided the camp, enforcing a BC NDP Minister of Transportation and Infrastructure trespass order. With their injunction against Camp Namegans and extra-judicial attack on Namegans Nation, the BC NDP has escalated the war on the poor and made it clear that we are living in a capitalist dictatorship, not a democratic country. The NDP attempts to differentiate itself from the openly pro-business, right-wing BC Liberal Party by claiming to represent the interest of the so-called middle class. The NDP attack on Indigenous-led tent cities in Saanich proves that Indigenous people and the non-native poor are not part of their imagined middle class constituency. Selina Robinson, the BC Minister of Housing, justified the police raid of the camp with the typical politician’s condescension, claiming campers were unsafe because the site was close to a road. Homeless people are vulnerable to police and vigilante violence, dangerous weather conditions, and a standard of living that forces them into constant survival mode. Traffic is not the most pressing safety concern for Namegans homeless, and breaking of their organized camp, scattering them into alleyways and along sidewalks throughout the city will not save them from traffic dangers. Since the NDP took power in BC last year, rates of homelessness have continued to rise and over 1000 people have died of drug overdoses. The BC NDP has continued the disastrous policies started by the BC Liberals of opening marginal amounts of “supportive housing” rather than regular social housing, and escalating the war on drugs with new anti-gang taskforces rather than ending drug prohibition. The BC NDP’s attacks on the Namegans homeless shows that they are also following the BC Liberals’ policies of criminalizing the poor rather than ending poverty. The march to the new Namegans site showed the strength of people’s power in motion, but it also showed the limits of that political strategy. 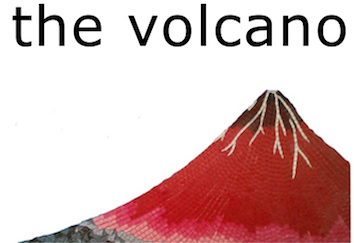 We were able to take a new site, but why were we not able to hold it? The day after the camp was secured, a camp resident named Lynne explained: “Yesterday when we were doing the protest, there were a lot of cops. There were a lot of supporters as well, but we need more than supporters.” The police forces she saw during the march weighed on her after the supporters went home. She described the fear the police instilled in certain camp members through their unreasonable force. “The cops told us, you have to keep moving or you’ll be arrested. I saw my friends getting arrested.” When 75 cops showed up to break the camp four days later, she was scared. “I didn’t want to go through that myself, so I complied with what they said. I packed my stuff up.” Like many campers, Lynne hoped the new Namegans site would be a place to stay put while housing was built. Instead, she was chased out by the NDP’s police operation. After establishing the camp she called Namegans Nation, Chrissy announced that the campers, if displaced again, would take 100 parks in 100 days. Although this was a symbolic claim rather than a developed strategy, it illuminated the spirit of the people to continue fighting against the war being waged against them by all major political parties, all levels of government, and the pigs. Italian communist Antonio Gramsci argued that when the State has hegemonic power, no one notices that power exists. The inverse is happening in BC: the NDP government’s attempt to tighten its noose around the necks of the homeless reveals that it has no answer to the crises of poverty, inequality, and homelessness, and that in its weakness it is threatened by self-organized people’s resistance. The NDP is waging war and we must strategize how to continue our maneuver around and through their police offensive and into our own free, self-organized spaces where we can continue to build our power. Does Discontent City’s court defeat mean the end of legal fights for homeless rights?